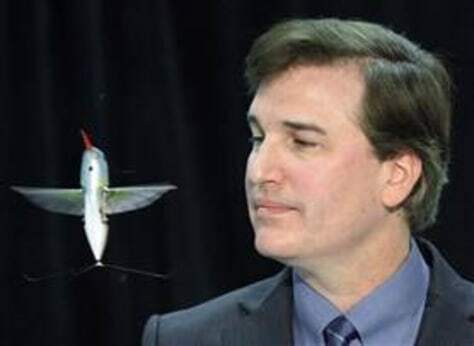 Matt Keennon, program director at AeroVironment, demonstrates a tiny drone aircraft known as the "nano-hummingbird," at the company's facility in Simi Valley, Calif., last week. The remote-controlled hummingbird plane is propelled only by the flapping of its two wings. It can climb and descend vertically, fly sideways, forward and backward, as well as rotate clockwise and counterclockwise, and hover.